The Sprinkling Can Inc. has been proudly serving Auburn and Dekalb County since 1977. We are family owned and operated with one downtown location to serve you. We are committed to offering the finest floral arrangements and gifts, backed by service that is prompt and friendly. We provide daily delivery service not only to Auburn, but also many neighboring towns, including: Ashley Avilla, Butler Corunna, Garrett, Hamilton, St. Joe, Spencerville, and Waterloo. Along with a large selection of fresh cut flowers and plants, we also offer balloons, plush animals and gourmet gift baskets-perfect for almost any occasion. Specialty items include Vera Bradley & DeBrand Chocolates. Our certified wedding consultants are available to assist you in planning your special day. We offer an extensive photo library to help you select the perfect flowers. 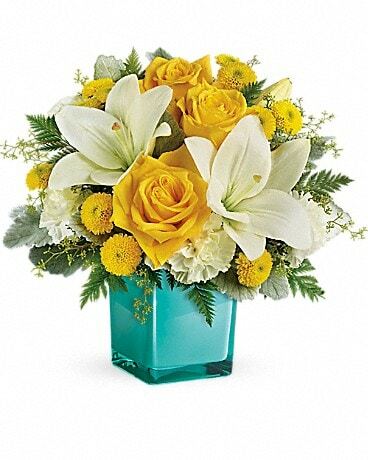 As a proud member of Teleflora, we are able to send your floral gifts or plants worldwide. We are also a Member of The Society Of American Florists, The Auburn Chamber of Commerce, and The Downtown Auburn Business Association. Our shop serves the following areas:Ashley, Butler, Hamilton, Spencerville, Waterloo, Garrett, Hudson, St Joe and Corunna. If you have any questions or need more information, please contact us by calling us directly at (800)848-3976 or (260)925-2818. We're always here to serve you and make your flower-sending experience a pleasure. U.S. orders must be received before 12:00 p.m./noon in the recipient's time zone to assure same-day delivery. Orders received after that time will be delivered the following day, except for Funerals.